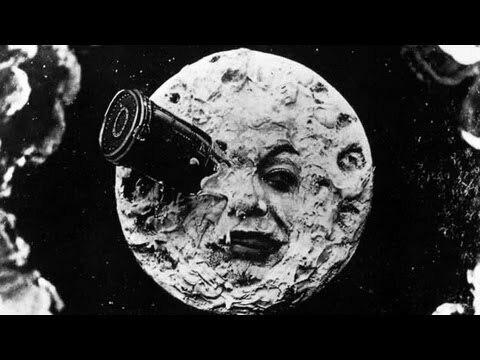 Le Voyage dans la Lune is loosely based off Jules Verne’s From the Earth to the Moon and also H.G. Wells’s adventure stories. At a meeting of astronomers, five brave adventurers (Nostradamus, Alcofrisbias, Omega, Microgemas, and Parafaragaramus) volunteer to fly to the moon in a bullet, shot into space by a group of ladies hired from the Chatelet Ballet. The scene in which the bullet hits the eye of the moon is one of the most iconic scenes in the early history of film. Once on the moon, Phoebe and Saturn awaken the crew who then venture into a cave where giant mushrooms grow. They encounter a race called the Selenites (referring to the ancient Greek word for “moon” and played by French acrobats) and discover that if they hit the Selenites with their umbrellas the creatures disappear into a cloud of smoke. After being brought before the leader of the Selenites the adventurers escape back to their bullet, which they push off the side of the moon and land back in the Atlantic ocean. They are celebrated in a parade with a statue reading “Labor Omnia Vincit” (Work Conquers All). This was Melies’s 400th film and was made on a budget of 10,000 Francs, a massive sum at the time. There were roughly 30 different tableaux, or scenes, in the film. He wrote, directed, acted in, produced, built the costumes and sets, and filmed the entire project. It was highly influential on Edwin Stanton Porter who began making narrative films such as The Life of an American Fireman (1903) and The Great Train Robbery (1903). Porter was able to build on the foundation laid by Melies, who placed prime importance on the shot, and Porter instead focused on the frame of the scene. By cutting frames, the director and editor had the ability to compress time- that is, by editing the film, the editor was able to more successfully suspend an audience’s disbelief through the arrangement of moving shots in time. D.W. Griffith was an early master of this strategy, as well. Other important films directed by George Melies include: Cendrillion or “Cinderella” (1899) whose scenes were modeled on the drawings of Gustave Dore and was highly influential on later directors like Cecil B. Demille; The Impossible Voyage (1904) which was modeled on A Trip to the Moon; and The Haunted Castle (1896-97). The name of Melies’s production company was called Star Film (1896) with the motto: “The whole world within reach.” For A Trip To The Moon, Melies rather painstakingly infused the logo of his company on the stars in some of the scenes to prevent theft of his footage, however thieves still colored over the logos and sold the film illegally. Melies made films until the outbreak of World War I, but he was unable to compete with the booming American market and in the end he died forgotten and indebted. Melies’s films are a fantastic journey through technical innovations and cinematic excellence. While many were created to complement his stage and magician’s performances, his later films such as The Impossible Voyage and The Haunted Castle are truly marvelous cinematic achievements. A Trip to the Moon is his best film and it deserves its rank at the top of the greatest films.